A constant refrain from politicians and others is that we have to leave the EU because we have to respect democracy, where by democracy they mean that 52% voted to do so. Arguments that the vote was based on lies by the Leave side are met with dismissive remarks like both sides were the same, or what do you expect from politicians and so forth. The important thing, we are told, is to ‘respect democracy’. In Poland the government recently passed a law which will dismiss all existing judges and allow the state to directly appoint their successors. This government was democratically elected, and the plan was in their manifesto. So why did the Polish President veto the plan, and why was the EU deeply concerned about it? Surely there was a clear mandate for this policy? Shouldn’t the President and the EU respect democracy? The reason why the President and the EU were right is that democracy is much more than having elections or referendums every so often. Checks and balances, and the rule of law, are crucial ingredients of a well functioning democracy. But having an independent judiciary is not the only essential characteristic of democracy besides voting. I personally think an important part of democracy is that politicians do not base campaigns on complete lies, and that knowledge, evidence, facts and expertise are respected and are easily accessible to all voters. Otherwise elections can be won by those who tell the biggest lies. If this happens and is not remedied democracy is a sham. As I noted here, lies were central to the Leave campaign (more money for the NHS, Turkey about to join the EU) and have already been shown to be untrue, while the central plank of the Remain campaign (dubbed Project Fear by Leave) has already come to pass. Polls suggest the Leave lies gained them votes. Only one side in the campaign spent a large amount of time dismissing or denigrating academic expertise (be it economists or lawyers). In the US the Republicans control Congress and the White House, all won by democratic elections where a key part of the Republican platform was repealing Obamacare. The Republicans therefore appear to have an overwhelming democratic mandate for this repeal. So why are so many people protesting against this repeal? Isn’t it important for democracy that repeal goes ahead? You may say that the Republicans did not say how they would repeal Obamacare, but neither did the Leave campaign say how they were going to leave the EU (or rather they said whatever people wanted to hear). You may say that Leave voters will lose their faith in the democratic system if Brexit doesn’t happen, but the same is surely true for Republican voters if Obamacare is not repealed. That is hardly a reason to do it. But referendums are not like elections, we are told. Mandates from elections can be challenged but referendum results must be respected. But where is it written that referendum results (particularly those that are so close) can never be challenged? Where is it written that we must be bound by the words of politicians during the referendum. If it turns out that the claims of one side in the referendum have been shown to be false, where is it written that the referendum result should nevertheless be cast in stone for a generation. The answer is nowhere, and for the good reasons that David Allen Green explains. All that is written is that parliament is sovereign. People overseas, in the EU or outside, are mystified at what the UK is currently doing. The main supporter of Brexit overseas is an authoritarian regime, which should give you a clue about what is going on. There are two overwhelming reasons for challenging the referendum result: it was arrived at after a deeply flawed campaign, and we now have information that clearly shows the extent of the Leave campaign's lies. The Leave campaign abused democracy before the vote with lies, and then abused the word subsequently to stifle any dissent. When a vote is won narrowly in an election based on lies that have now been exposed, it seems to me a hallmark of a functioning democracy is that the original vote is challenged and voters have a chance to vote again. We could add whether we should be bound by an electorate chosen to keep Brexiteers happy. In the contest between economists and Brexiteers, which I last visited here, the score was 5:0 and Brexit supporters were already leaving the ground. But in that total I had not counted the 2017 Q1 GDP figure, because it could have been a statistical blip. We now have the first estimate of Q2 growth. I’m afraid the economists have scored again. You may remember that Brexiteers made an awful lot of fuss when growth in the second half of 2016 was mediocre  rather than plain bad. We now know why that was: consumers were borrowing and running down savings. That is not a source of sustainable growth. Growth in the first half of 2017 (2017 H1) has been virtually non-existent. As this chart shows, we have not seen such slow growth since before the 2013 ‘recovery’ period. What is more, what little growth there was in 2017 H1 seems to be coming from consumption due to more borrowing, which is worrying for the future. (We will know more when the expenditure breakdown is released with the second estimate.) Those who argued that Brexit would bring a short term slowdown have been proved right: they just got their timing slightly wrong. Have all those who earlier lambasted forecasts of a short term Brexit slowdown offered their apologies? Pigs will fly. Yet in his press release when the figures were announced, Labour’s Chancellor in waiting John McDonnell mentioned the government’s austerity policy but not Brexit. 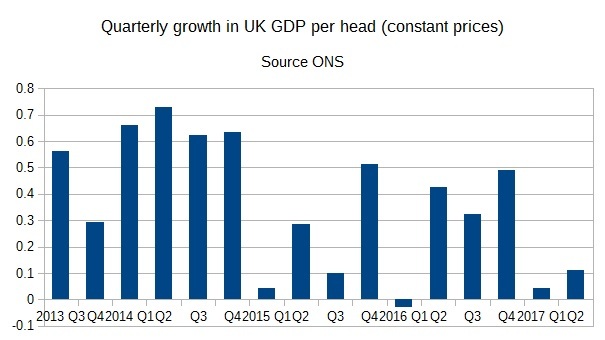 This is surprising, but how do we know whether austerity is to blame for this slowdown or Brexit? The answer is both are to blame. After a pause, fiscal policy (to judge from the OECD’s estimate of the underlying primary balance) started taking demand out of the economy in 2015 and particularly 2016. That will have been an important factor behind the slow growth in both years. However the additional slowdown in the first half of 2017 is likely to be a Brexit phenomenon. For those who say Brexit has not happened yet, the mechanism is clear. The Brexit depreciation immediately after the vote has led to a fall in real incomes, meaning less consumption. It has not led to any compensating increase in exports because firms are not going to expand markets that might soon disappear because of leaving the Single Market or customs union. The Brexit depreciation has brought forward some of the negative impacts of Brexit on living standards. Yet austerity is still to blame in the following respect. The Brexit slowdown in 2017 H1 is a slowdown in demand, not supply. Monetary policy did what it could after the Brexit vote, but with interest rates at their lower bound it can do no more. (I trust there are some very embarrassed faces on the MPC right now among those suggesting a rate rise.) Fiscal policy should have helped monetary policy out by filling the demand gap, but those running the Treasury refuse to acknowledge this role for fiscal policy. So McDonnell is correct to blame austerity, but his failure to also blame Brexit I’m afraid reflects darker political motives. The silence on Brexit as a cause of the current stagnation is because Labour, like the government, supports Brexit. No one wants to say that the Brexit vote is already causing considerable damage. Just like courtiers to a monarch, no one dares tell the king (the 52%) the bad news that their decision have brought harm in case the king takes his anger out on the messenger (the political parties). Growth in Q4 was just below historic trends, but growth in Q3 was way below. Hence mediocre. Confusing the EU with the Eurozone. Larry talks about the problems with the ECB, the SGP, and mass unemployment, but these are all valid criticisms of the Eurozone. There is no attempt to say why that has any impact on the UK as part of the EU. Inferring that all the UK’s problems are somehow down to the EU, without providing any evidence that they are. Asserting that the EU prevents the UK doing what it needs to do to tackle (c) in ways that are economical with the truth (see more below). Is levying a huge fine on Google because its search engine gives preference to its own shopping comparison site an example of neoliberalism? Is a maximum working week? Are their environmental standards? These are all examples of a collective of states interfering with firms and the market. One of the strong and left wing arguments for the EU is that only at this level can you avoid large multinational corporations blackmailing states that attempted to challenge them in similar ways. I am sure there are many examples where the EU could do this more effectively, but at least they are trying. The argument for Lexit is therefore similar to the argument against globalisation. The problems that a combination of globalisation and technical change has created for many communities are real enough. But Lexit arguments typically ignore two key points. 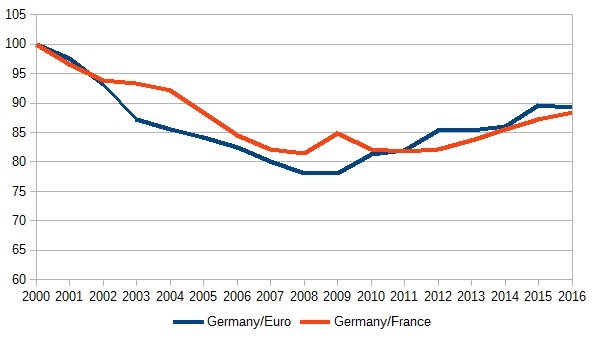 First, globalisation has brought huge gains for many poorer countries. That applies as much to the poorer states of the EU as it does to China and India. Of course what is being done to Greece is appalling (and I have not hesitated to say so on many occasions), but this once again is a result of a common currency, not trade liberalisation under the EU. Indeed, one of the reasons the Eurozone’s blackmail of Greece worked is that a majority of Greeks want to stay in the EU. Second, the gains for the UK that have followed most trade liberalisation are real enough, which is why there are large costs to leaving the Single Market or customs union. Larry spins this by saying the “left needs to be very careful about running with the idea that business should be able to veto decisions made by the electorate.” This is a line that shows the left at its worst. The costs of Brexit do not necessarily fall on business (which is often mobile) but on ordinary UK citizens. What proponents of Lexit have to show is that the benefits of the policy freedom Brexit gives you outweigh these costs. The most promising way to help the losers from trade liberalisation (and technical progress) is through an active industrial and regional policy. Proponents of Lexit argue that the EU would prevent such a strategy. If we are talking about giving aid to declining uncompetitive sectors, then many would argue that it is a good thing that the EU does stop that happening. But to suggest that the EU is opposed to any kind of regional aid seems to conflict with the existence of the EU’s Cohesion Policy, that has benefited many areas in the UK. For a more general discussion of the justifications the EU gives for intervening in the market, see William Davies here. The set of policies that the EU prevents but which any reasonable trade deal with the EU would allow are pretty small, with the key exception of controlling immigration. Larry says that freedom of movement has not benefited workers. I think he would find plenty of EU workers in the UK who would disagree (at least before Brexit). Just as the movement of goods across borders benefits all, so can the movement of people. Most of the analysis I have seen has shown that recent immigration into the UK has been beneficial to UK workers once you take everything into account. Ignoring all that by talking about the ‘lived experience of ordinary people’ (from here) suggests an attitude to knowledge and evidence worthy of UKIP. Which brings me full circle. The first of these interventions could reflect an ordoliberal rather than neoliberal view, but the second two not so much. Simon Tilford has a post where he explores the roots of Brexit in a kind of UK exceptionalism. He argues that “the underlying reason [for the Brexit vote] is the hubris and ignorance of much of the British elite, not just the eurosceptics among it”. I want to expand on that. I do not think this ignorance and hubris is confined to the UK’s role in the world. It also extends to an attitude to knowledge of all kinds, and I suspect it is possible to date when this began to the revolutionary zeal of the right under Thatcher. The reality was that the Thatcher and later Major governments did subsequently often take note of what experts were saying, but the myth on the right prevailed. Before the Conservatives regained power in 2010, they thought very little of going against the advice of the majority of economists over austerity, although to be fair they were later supported in this by senior civil servants and the governor of the Bank of England. Policy based evidence replaced evidenced based policy. But this was the relatively sane wing of the party, as we discovered during the referendum campaign. We know the EU referendum campaign largely ignored experts, whether they were economists, lawyers or experts in international relations. What I think surprised many is that the Leavers fantasy was not just a device to obtain votes, but actually reflected what the Brexiteers believed. Since the referendum the government has clung to the fantasy, and ignored or dismissed all the advice it was getting from its civil servants. (In two cases dismissed meant sacking or resignation.) As Steven Bullock says, the EU side are in despair that the UK has yet to work out a realistic position on many issues. Because large parts of the UK public, relying on the right wing press for their news, still believe in the fantasy, some in the main opposition party think their best strategy is to ape their opponents. As a result, we are in a strange bifurcated world. One part consists of pretty well anyone who knows anything about the economics, politics or legal aspects of Brexit. They realise how hard Brexit will be, know how much damage it could do, and by and large think it will be disastrous for the UK. (Experts tend to recognise and respect knowledge in other areas.) The other part lives in a different world, the world of the media and politicians, where everyone still lives the fantasy. In this respect, we are no different from what is happening across the Atlantic. Angus Deaton notes the tragic irony that in the year the great nobel prize winning US economist Ken Arrow dies, the Republican administration is ignoring one of his great achievements, which was to show why a simple market in healthcare will not work. The only ‘expert’ this Republican administration seems to recognise is Ayn Rand. If it is successful in replacing or sabotaging Obamacare, millions will lose coverage and thousands will die as a result. The experts (such as the CBO) who predict this are accused of inaccuracy by a White House that cannot even be bothered to check its spelling of 'inaccurately'. May holding Trump's hand shortly after he became president was indeed symbolic. Those who justify ignoring experts often talk about them as ‘unaccountable elites’ who have ulterior motives in giving the advice they do. In reality ignoring expertise means dismissing evidence, ignoring history and experience, and eventually denying straightforward facts. It leads to the politics of barefaced lying, such as asserting that a new trade agreement can be negotiated in little over a year. This disdain for knowledge is not a prerogative of the right: you can find it on the left among those who say, for example, that all social science is inherently value laden and therefore political. (Ironically often dismissing mainstream economics as a buttress of neoliberalism, the same economics that the right are so keen to discredit.) The difference is that that the knowledge dismissing right have power in the UK and US, and so we are suffering the consequences of their evidence-free politics. Sir Keith Joseph tried to abolish the Social Science Research Council. It seems finally that the government has accepted a reality that was obvious months ago to those who listened to experts. **Postscript 21/07/17 As Sasha Clarkson reminds me, one of that group now spends his time denying climate change. There are two schools of thought about why Labour is adopting a confusing and conflicting position over Brexit which is almost the same as the government’s line. The first is that Labour is simply confused and conflicted. The more interesting is that this is deliberate triangulation: sound slightly less enthusiastic about Brexit to keep its core anti-Brexit vote, but also not to antagonise its minority pro-Brexit vote. I do not know which view is correct, and it is possible that both are. To the extent that it is triangulation, is this the right thing for Labour to do? This question is related to a recent Guardian article where John Harris argues that although Brexit will be a disaster it has to happen. If triangulation is how Labour justifies its own position on Brexit, the obvious question to ask is why they made so much fuss when their predecessors appeared to triangulate over austerity. Brexit, like austerity, will be extremely harmful for the economy. So what made triangulation (or appeasement, if you want to use a more pejorative word) over austerity a huge political mistake, but allows the same for Brexit acceptable? If you take the position that political parties and politicians should always argue for what they or their members believe in, rather than adapting their positions to what is politically possible or smart, then there is indeed no difference. Those who said that Labour’s failure to campaign loudly against austerity in 2015 represented some kind of moral betrayal should, for consistency, be arguing the same over Brexit. A more political answer would be that in the case of Brexit triangulation worked, while for austerity it did not. In 2015 the election was all about economic competence, and Labour triangulation on austerity had the effect of conceding competence given the prevailing ‘clearing up the mess’ narrative. Of course Labour did not win the 2017 election, but they achieved during the campaign a surge in popularity that is virtually unprecedented. Labour supporters who are also anti-Brexit will tell you that this was because Labour made the election about austerity (or more accurately the size of the state) rather than about Brexit. If instead Labour had campaigned against Brexit, the election would have been a rerun of the referendum (as May wanted it to be) and because of the geographical concentration of the pro-EU vote Labour would have lost badly. Even if you buy this, however, there remains a question of whether the triangulation strategy will continue to work, and whether it could have the unfortunate side-effect of ensuring Brexit will happen when otherwise it might be stopped. To assess this question, we need to take a realistic view of how the Brexit process is likely to evolve. We know pretty well what the final deal will look like. It will be along the lines of the deal put on the table by the EU, together with a transition period during which we stay in the customs union and Single Market (and continue to pay for that privilege). We know this because the Article 50 process gives the EU the whip hand: the No Deal outcome, which is what happens if time runs out, is so much worse for the leaving country and there is no time to negotiate a trade deal. As a result, to use a term loved by Conservative politicians but which in this case happens to be true, there is no alternative deal to be done. What this means is that we will leave the EU in 2019, but remain in the Single Market and customs union until both sides negotiate something else. Can a final deal of this kind be stopped? Logically you might think that MPs would realise that, compared to EU membership, all this deal does is mean the UK gets no say in the rules governing the Single Market and in addition we have to pay a significant sum of money for that lack of control! It is pure lose, lose, with the only positive (from a Leavers point of view) being the possibility of avoiding Freedom of Movement at some future date. Unfortunately logic is something not normally associated with Brexit. In reality I suspect most Conservative MPs will agree to this (for the moment) softest of soft Brexits with a sigh of relief, telling themselves that they have fulfilled the will of the people with as little damage as possible. The triangulation strategy, which is essentially designed to prevent Brexit becoming a pro/anti party political issue, suggests Labour will go along with this. The only way either of these things might not happen is if public opinion turns against Brexit over the next year. Will opinion move by enough to at least make it possible to get a vote for a second referendum through parliament? Who knows, but there are some structural factors against it. The first is the right wing press, which after all are the people who got us into this mess. The second concerns the broadcast media. Its operating model is based on a two party system, and if neither of these parties are making the case that our current difficulties are a result of Brexit then that case will not receive the exposure it deserves. Here we get to why many of those who oppose Brexit are angry at Labour’s position. They feel that without a major party constantly reminding the public of the problems that Brexit is creating their chance of turning public opinion is much reduced. I suspect Labour’s response, if it was honest about what it was doing, would be to say that they will not risk the next election by taking a public anti-Brexit position. It is the Conservatives who got us into this mess, and they have to make the first move to get us out. The retort that Labour are reducing the scope of what they can do in government by allowing Brexit to happen has less force if we are staying in the Single Market and customs union. This is related to the argument made by John Harris, which is that a vote to reverse Brexit would do nothing to reverse what caused the Brexit vote in the first place. If Brexit was stopped, UKIP would be given a new lease of life, and “the myth of betrayal ... would sit at the heart of our politics”. To recast what he is saying in my own words, you cannot undo social conservatism and the effects of economic deprivation, plus a decade or more of propaganda from the press, with a single vote of parliament. It is related to the earlier argument because Labour might say that they cannot reverse these same forces by a year of campaigning against Brexit before we leave. Unfortunately there seems to be no reason why this state of affairs should change during the transition period. The government, committed to controlling immigration, will be determined to get a deal that ends free movement. Labour, to avoid immigration becoming too much of an election issue, will continue to triangulate. The best  hope I can see to avoid further Brexit damage is for Labour to defeat the Conservatives at an election, and quickly realise that they are better off staying in the Single Market and encouraging free movement. Which of course gets us back to why they are triangulating in the first place. It was designed in part to discourage countries leaving the EU. As David Allen Green suggests, there was a better way to leave the EU. ‘best’ as in better than any other likely outcome. Should I be grateful for the second sentence, being one of ‘those’ who think that way? I think the reverse is true. The OBR has played the tune the government wanted, but it is the wrong tune, and this now mature and independent organisation is capable of much better than this. I will first deal with a particular issue to do with monetary policy, and then talk more generally about the concept of ‘fiscal risks’. Our macroeconomic institutional architecture is based around what I have called the consensus view about macroeconomic policy. This consensus involves what economists call an assignment. The stabilisation of output and inflation is assigned to independent central banks operating monetary policy. Fiscal policy should be confined to managing the government’s deficit and debt, and to help it with that task there should be a combination of fiscal rules and independent fiscal institutions (aka fiscal councils, like the OBR). In a consensus assignment world, the job of a fiscal council is to stop deficit bias: the tendency clearly observable in some countries before the global financial crisis for deficits to creep up over time. In particular, when all is going well and the deficit appears not to be an issue, it is their job to tell the government to 'fix the roof while the sun shines’. As I and others have noted many times, this consensus assignment has an Achilles Heel, which is that nominal interest rates cannot go below a number close to zero, the so-called Zero Lower Bound (ZLB). In the absence of some mechanism to allow interest rates to become significantly negative, that ZLB problem means that sometimes fiscal policy makers have to help monetary policy in its stabilisation role. The simple consensus assignment breaks down. Although most academic macroeconomists recognise that, our institutions find it hard to do so. Monetary policymakers in the UK and Eurozone find it very difficult to say that they have lost their main instrument, and that therefore they can no longer reliably do their job. It seems that our fiscal council, the OBR, has similar problems. We are currently at the ZLB. The most immediate risk we therefore face is that we are hit by a negative shock and monetary policy is unable to respond effectively. Hence the quote from their document above. But as far as I can see that is it. In their section in the Executive Summary on the risk due to a recession I would have thought the ZLB problem was worth at least mentioning, but it does not appear. Indeed I’m not sure the term ZLB or liquidity trap appear anywhere in the document. I’m sure the OBR would in defence say two things: assessments of fiscal risks generally look at risks to fiscal sustainability not macroeconomic stabilisation, and their remit precludes them from talking about alternative fiscal policy paths. This is all true. The Treasury wanted a report that would enable them to say we must continue with austerity because of all the risks identified by the OBR. The Treasury also wrote the OBR’s current remit. But the OBR is supposed to be independent. Just because the government tries to pretend that there is no Achilles Heel to the consensus assignment, that does not mean it has to go along with that act. In particular, it will (I hope) have noted that the main opposition - which came close to defeating the current government - has a fiscal rule that explicitly says that fiscal policy needs to switch from stabilising debt to stabilising the economy when interest rates are at their lower bound (like now). In this context, I think something beyond a single sentence alluding to the ZLB would have been appropriate. Tony Yates said similar things yesterday. He also made another important point: a key role of government in many areas is to be a risk absorber. It assumes risks, because it is beneficial to take risks away from individuals or individual generations and spread them more widely, and often the state is the only institution that can do this. In addition, its deficit and debt should be a macroeconomic shock absorber. Given all that, why exactly should we be concerned if various shocks increase government debt? That is what is supposed to happen! To put the term risk and attach it to some level of debt or deficit, giving us ‘fiscal risks’, is questionable. It is a bit like saying their is a risk that your central heating will come on if it gets cold: that is not a risk, but why it is there. The OBR would no doubt respond that the government has a mandate in terms of a deficit or debt target, and it has been asked to look at risks that this may not be met. But that should not stop an independent OBR from asking more fundamental questions. Implicit in the idea of ‘fiscal risks’ is either a belief that there is an optimal level of debt which is below current levels, or a view that there is some level of debt so high that markets would start worrying about the government choosing to default. If we are worried about a debt burden on future generations, does it make sense to put all that burden on a current, already disadvantaged, younger working generation? Unless these key issues are addressed, all the risk assessment the report undertakes is meaningless, or worse still just provides support for the government’s misguided policy. It is time the OBR stopped being constrained by its remit, and started providing the public with a useful framework in which to think about ‘fiscal risks’.